Mycotoxins have long been a concern to livestock producers when environmental conditions during the growing season were conducive to mold growth on the field crop. Mycotoxins are now more frequently being associated with crops like corn silage that include not just grain but a high percentage of stalks and stover. 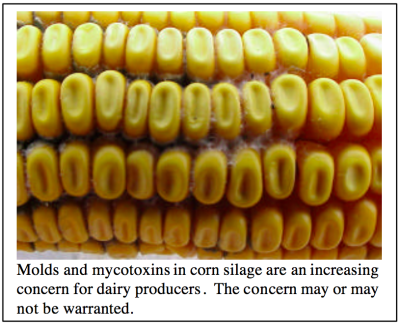 Recently, mycotoxins in corn silage have been identified with dairy herd health problems during years with near ideal growing conditions and record corn yields. A sensory inspection of the silage indicated no visible mold, a good smell, and from all indications top management from field to storage (i.e. proper moisture, well packed, etc.). These situations were frustrating for both the producer and those in the industry who were trying to find some answers. Unfortunately, there are still more questions than answers and a need for more research that is both time consuming and costly. This presentation will address agronomic factors associated with the growth and prevention of field molds in corn caused by Fusarium, the most common species in the upper Midwest associated with mycotoxin problems in livestock. Molds, depending on type, can grow under a wide range of environments. The general conditions needed for Fusarium field molds to proliferate are high humidity (>70%), oxygen, and temperatures that fluctuate between hot days and cool nights. Fusarium molds are responsible for a wide range of diseases in grass and cereal crops. In wheat and other small grains, Fusarium causes head scab, an economically devastating disease for growers in the wheat belt and one that is receiving a large amount of research attention. In corn, Fusarium causes Gibberella and Fusarium stalk rot, Fusarium crown rot, Fusarium kernel rot, and Gibberella ear rot. Fusarium molds are everywhere in a field environment. They overwinter in the soil, on plant debris, and on or in the seed. Hence, a goal of eliminating Fusarium is unrealistic. Environment and plant stress determine the extent of plant infection by the mold. These factors need to be managed to every extent possible. This is not an easy task when we consider that molds and mold spores may enter the plant through the roots, via pollen transfer down the silks, through the seed kernel pericarp (where damage exists), and through plant wounds caused by wind, hail, mechanical damage, or insect feeding. Although not confirmed by research, it’s highly possible that certain soil types and cropping systems may be more conducive to supporting high mold levels than others (for example, a no-till cropping system on a clay-based soil). So how do mycotoxins fit into the picture? Molds are no different from any other living organism – – – they need nutrients to grow. Competition for plant nutrients comes from both the host plant and other microorganisms. In an effort to help gain a competitive advantage, the mold produces a toxin. Mycotoxin production is likely going to be greatest when plant demand for nutrients is highest or when nutrient availability is limited. Once produced, most of these toxic compounds are not destroyed by heat, time, or fermentation. There are 400 to 500 known mycotoxins. Numerous feeding studies and surveys with dairy cattle have not been able to conclusively show a negative cause-effect relationship based on elevated pure DON levels. Rather, most researchers agree that it is probably just a marker for some “yet to be determined” anti-quality compound. Fumonisin, a recently discovered mycotoxin, has been identified as a potential human carcinogen and the causative agent for a fatal brain disease in horses. Similar to zearalenone, cattle do not appear to be extremely sensitive to fumonisin. The visible mold/mycotoxin relationship is not clear-cut. In other words, it is possible to have visible mold and not have any mycotoxins. Conversely, it is also possible to NOT see any visible mold and have relatively high levels of mycotoxins. This is what makes management and the potential identification of mycotoxin feeding problems so difficult. What are the agronomic factors involved in the formation of molds and mycotoxins? In general, a balanced soil fertility program reduces plant stress and the likelihood for subsequent disease development. More specifically, two major nutrients, nitrogen (N) and potassium (K), have been directly associated with increased stalk rot in field corn. Either excess or low amounts of N can increase stalk rot incidence. Excess N is especially a problem where low soil K levels exist. Low soil K levels independent of N availability can also increase the risk for stalk rot and perhaps ultimately the production of mycotoxins. Although it’s no secret that some hybrids are more susceptible to plant disease than others, the natural selection of the highest yielding hybrids for marketing indirectly helps in avoiding those hybrids with extreme susceptibility and stalk strength problems. This said, many seed companies offer additional hybrid ratings against specific corn stalk, ear, and leaf diseases. At least some seed corn companies are beginning to score and screen hybrids for mycotoxin levels but these efforts are just beginning and not enough data is available to be made public. Many producers are “pushing the limit” on hybrid maturity in an effort to capture maximum yields. This strategy pays dividends when planting is done early, normal heat units are accrued, and there isn’t an early fall frost. However, when all or some of the previously mentioned don’t happen, it sets the corn up for a longer dry down period under environmental conditions that are potentially more conducive to stalk and ear mold development. Kernel texture is a hybrid trait that is currently being debated as either good or bad from the standpoint of feed quality and mold invasion (or potential mycotoxin production). Some seed industry experts argue that a soft kernel texture is desirable for better feed digestion of corn harvested as silage or high moisture grain. Others argue that it doesn’t make any difference and soft kernels are more susceptible to ear molds and mycotoxins. At this point, neither side has a wealth of research to back any of the claims, although it is safe to say that a soft kernel is more susceptible to damage than a hard kernel. Kernel texture is probably a non-factor if corn is harvested for silage between 65-70 percent whole plant moisture (but, of course, that doesn’t always happen). Finally, there is the issue of European corn borer (ECB) resistant Bt corn. At least some seed companies are promoting the purchase of Bt as a method of reducing or eliminating ear molds and mycotoxins. The underlying theory is that corn resistant to ECB will maintain stalk, cob, and kernel integrity and prevent a pathway for detrimental mold spores to enter or be carried into the plant tissue. At Iowa State University, researchers found higher levels of ear rot and fumonisins in non-Bt lines compared to their Bt counterparts. Differences were noted between different Bt events based on gene expression in plant parts and duration of the Bt effectiveness. Corn was harvested at about 20% kernel moisture (later than would be normal for high moisture grain or silage). Although Bt corn hybrids offer another tool against potentially reducing mold and mycotoxin occurrence, producers who plant these hybrids are by no means immune to the problem. Recall that molds can enter the plant through the roots, silks, and other avenues independent of insect damage. If environmental conditions are favorable, stalk and ear molds can still develop in the presence of the Bt gene. Farmer experience from recent years confirms this fact. From a plant genetics standpoint, perhaps our greatest hope to drastically reduce or eliminate mycotoxin formation lies in the development of transgenic crops with the ability to resist mold formation or detoxify the mycotoxin. Research work specifically along these lines is already being done with corn and wheat. It’s no secret that high crop residue farming systems increase the risk for a number of different plant diseases. Corn residue that remains on the soil surface offers an overwintering host that can produce numerous ground level mold spores for the subsequent crop. For this reason, crop rotation to a non-susceptible crop becomes important in conservation tillage systems. In today’s farming environment, reverting back to a clean tillage/moldboard plow system to reduce the risk of plant disease is not an option most producers can employ because of economic, social, and environmental implications. Fungi that cause leaf diseases in corn are not mycotoxin producers but their control may indirectly impact the potential for mold and mycotoxin development in other plant parts. If leaf diseases are kept in check through either hybrid selection or the use of a foliar fungicide, leaf photosynthesis is maximized and prolonged. This, in turn, delays the cannibalization of stalk nutrients and makes the stalk less predisposed to the development of disease. A timely harvest insures that the crop will not stand in the field any longer than necessary. It is during the fall that conditions are optimum for Fusarium ear mold and mycotoxin development (alternating hot-cold temperatures between 45 and 75 degrees Fahrenheit). Corn silage that is too dry is also more difficult to pack in the silo. Although field fungi and mycotoxin levels are usually reported not to increase after the crop has been ensiled and gone through fermentation, levels will continue to increase as long as oxygen is present and the pH is sufficiently high. As a response to producer and industry concerns about mycotoxins in corn silage, UW-Extension Team Forage initiated a field survey in the fall of 2000 to quantify mycotoxin levels of plants in standing corn that was targeted for silage harvest. Fields and farms were selected based on either perceived or documented past mycotoxin problems. Ten samples of four corn stalks each were collected from six different fields at R5 (early dent) and immediately before harvest (1⁄2– 3⁄4 milk line). Stalks were chopped and sub-sampled, then sent to the Marshfield Soil and Forage Testing Lab to be ground and dried. These samples were sent to the North Dakota State Vet Diagnostic Lab for mycotoxin (trichothecenes) screening using gas chromatography. Samples for two of the fields were also sent to the University of Wisconsin Department of Plant Pathology for Fusarium screening. All of the tested samples were positive for Fusarium. Of the 17 mycotoxins screened, only DON (vomitoxin) was found at significant levels (>5 ppm) for any one sample. Only one sample (n = 70) of the R5 samples submitted was greater than 5 ppm for DON but it was the highest level of any submitted in the survey (41.6 ppm). Twenty-four percent of the R5 samples were between 0.1 – 4.9 ppm DON. The number of samples over 5 ppm DON increased to four with the harvest time sampling date (n = 83). However, about 63% of the samples had between 0.1 – 4.9 ppm DON. This survey confirmed that mycotoxins are predominantly a field rather than storage problem. Additionally, mycotoxin levels can vary significantly from field to field, area of field to area, and plant-to-plant. Testing several plants prior to harvest to check for potential mycotoxin problems is not feasible. In most cases, there is simply too much variation. Positive DON levels, although sometimes small, appear to be commonplace. Visible mold does not always translate into measurable mycotoxin levels. There is still a whole lot more to learn about mycotoxins (plant parts, fungicides, time of infection, hybrid differences, etc.). Fusarium happens: soil to seed to plant tissue. There’s little any of us can do about that. Environment usually humbles genetics in the realm of plant diseases. We can, however, empty management practices to help keep mold spores inactive. Soil fertility – a balanced program is key. Hybrid selection – disease resistance, relative maturity, insect resistance, kernel texture, etc. Tillage and crop rotation – often little can be done about tillage, but crop rotation to non-susceptible crops will be a benefit. Control leaf diseases – genetically for sure, but the book is still out on fungicides. Optimum harvest timing – extremely important. The longer the crop stands in the field, the more opportunity for mold and mycotoxin development. Harvest at the optimum moisture. Transgenic hybrids may be our greatest hope toward seeing real progress in reducing the risk of molds and mycotoxins. Is DON (vomitoxin) really the problem? ?